Currently we have 140,000 square feet of secured inside storage space, complemented by our loading, unloading, and transportation services. Choose between heated, unheated, and freezer storage. Rental Terms are by the month or year. If your machinery or equipment doesn't need to be inside, please consider our more cost effective outside storage. 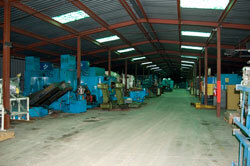 We have 75,000 square feet available, all secured by fencing. Many of our customers take advantage of our mobile steel storage containers. These weather resistant, vented containers can be delivered right to your location. Use them as long as you need, give us a call when your done and we will pick them up. 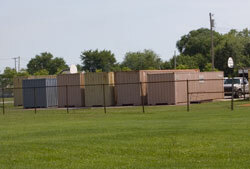 Standard containers are 20 or 40 feet long, 8 feet wide and 8 feet tall. And you can choose to rent, or buy. We've found this storage to be ideal for construction companies and contractors, retailers, manufacturers, bottlers, and beverage companies, and recreational venhicle dealers, to name a few. 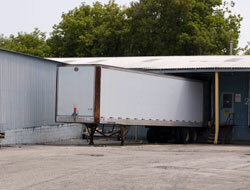 Dry Van Storage Trailers are perfect for dock height loading areas. They're standard 48-foot long semitrailers delivered to your site. Use them as long as you need, give us a call when your done and we will pick them up.